<"Product Details" class="s-access-image cfMarker" data-search-image-load= width="218" height="218">. 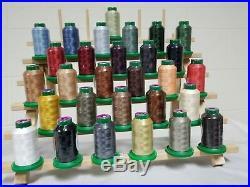 This is 100% Polyester 40 weight thread. This is made for the OESD Starry Night Tiling Scene by Dona Gelsinger. 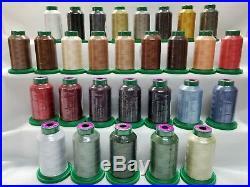 This are all 1000 meters of Isacord thread with 1000m. Starry Night by Dona Gelsinger. 0015, 0020, 0138, 0532, 0555, 0576, 0622, 0776, 0853, 0933. 0970, 1133, 1141, 1233, 1346, 1362, 1521, 1725, 2022, 2336. 2776, 3574, 3743, 3951, 3953, 4071, 5552, 5555, 5743, 6071. The item “OESD Starry Night Isacord Embroidery Thread Kit Tiling Scene by Dona Gelsinger” is in sale since Friday, September 7, 2018. This item is in the category “Crafts\Needlecrafts & Yarn\Embroidery & Cross Stitch\Embroidery Machine Supplies\Machine Bobbins & Thread”. The seller is “imachinegroup” and is located in Fullerton, California. This item can be shipped to United States.